Our sun is quite these days with very few sunspots at the visible surface. There is no good solar prominences as well. Few days ago, i imaged a small sunspot, which is quite huge by our terrestrial standards. This spot has moved to the eastern limb now and a new region has appeared from the west (see arrowhead below). On the full disk it is barely definable but in my image our Sun has just shown us its broken heart! 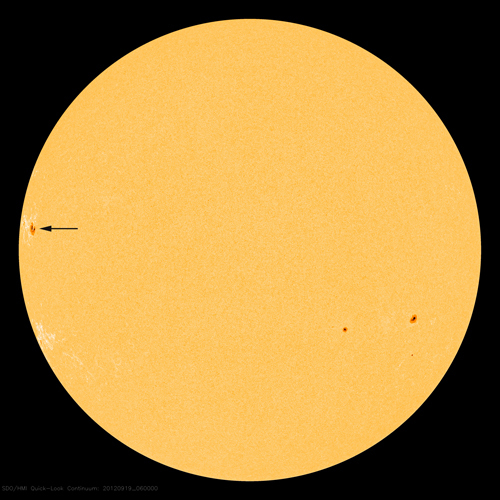 At least three sunspots have merged to create this group. Coming forecast seems to be clear for my location so i will try to see how this region evolve in the near future. Sun is a highly dynamic system and it is always going through visual changes. I also saw this region with Halpha telescope but i think i would wait for some time to image it in halpha light.